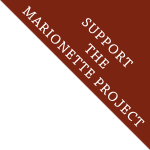 The Marionette Project will be built during the residency's open seasons (June through October annually), and done concurrently with other maintenance and construction projects at Art Farm for 12 hours per week. For this reason, the Marionette Project will be separated into three work phases: Foundation & Framework, Barn Raising, and Inhabitation. Hover or click on the yellow signage above to view the estimated project budget for each phase of the Marionette Project. 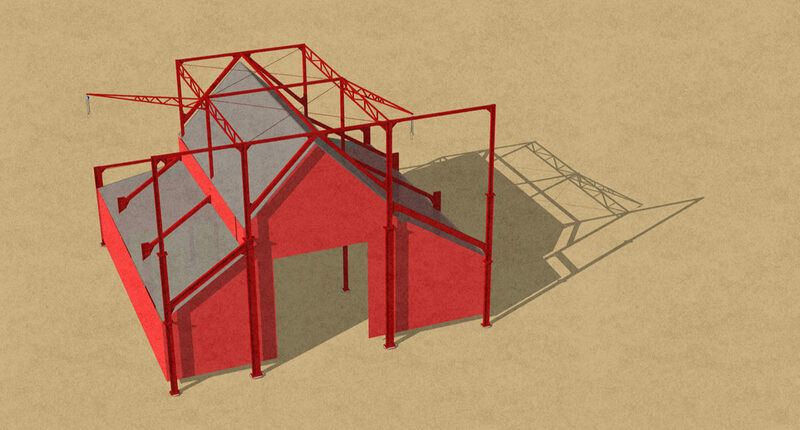 The Marionette Project is one of Art Farm's century-old Nebraskan barn suspended within a network of air cord cables amid 12 tons of steel framework. The project brings exposure to the plight of the vanishing late 19th-century farm buildings while proposing new perspectives on heritage based on their impermanence. 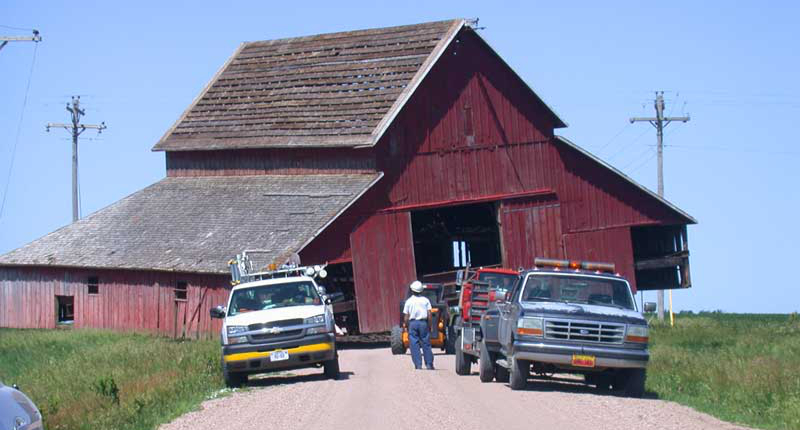 The 'Floating Barn' has survived many phases over its lifespan. 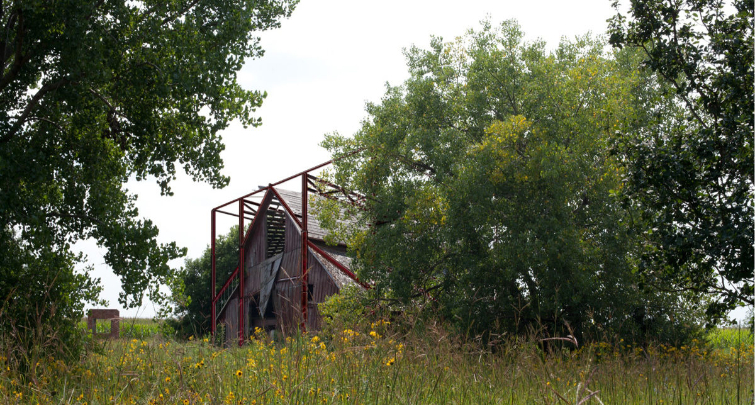 Originally a storage space for livestock and hay, the barn was abandoned for fifty-four years until it was physically moved to Art Farm twelve years ago. In each year since, 'Floating Barn's vitality flourished. A functioning performing-arts venue and muse to residents of Art Farm, the 'Floating Barn' sets the scene for innumerable concerts, dance events, performance art, and other happenings. 'Floating Barn' weathers extremities gracefully, seemingly defying laws of physics with its remarkable ability to unfurl without falling. 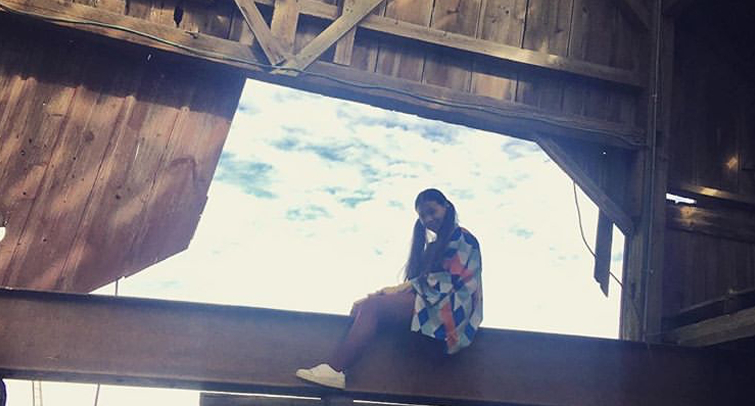 This past winter, an ice storm led to the beloved barn's collapse, begging questions concerning the future of the 'Floating Barn'. For many residents (most notably poets), admiration for the 'Floating Barn' stems from its "timber frame constellation", "lofted gasp of shelter and stars", mellifluous acoustics, and "inhale of breath between lift and collapse" 1 . 1 E xcerpt from 'Dearest Fox', a poem by Chicago-based poet and Art Farm alumni, Benjamin Clark, who drew inspiration from the 'Floating Barn'. • Continue the Floating Barn's existing function as a performing arts venue for the residents of Art Farm. 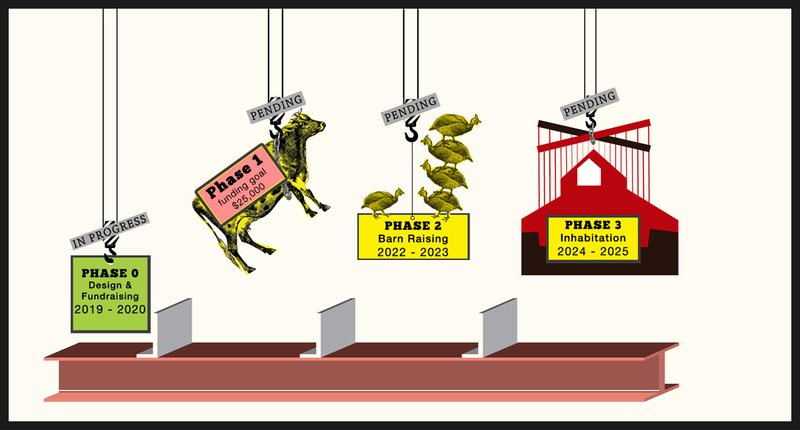 • Extend the Floating Barn's twelve-year long slow-motion collapse with a new act. • Expose the local rural community to unorthodox ideas and approaches made using objects and or practices that are familiar to them as publicly visible art. • Inspire artists to imagine alternative concepts of what it means to preserve impermanence and to impermanently preserve. The Marionette Project opens the discussion on architectural heritage by commemorating what a place felt like instead of what it looked like. Convention preservation maintains the illusion that buildings can last forever in a fixed stage of their life, but over time the history and nature of buildings change. Redirecting attention towards architecturally preserving subjective experience can potentially free a building from custodial responsibility and break the perception that heritage is defined by objective structures. The iconic American barn has been quietly disappearing from rural landscapes for decades due to government policy that has rendered rural vernacular architecture obsolete. 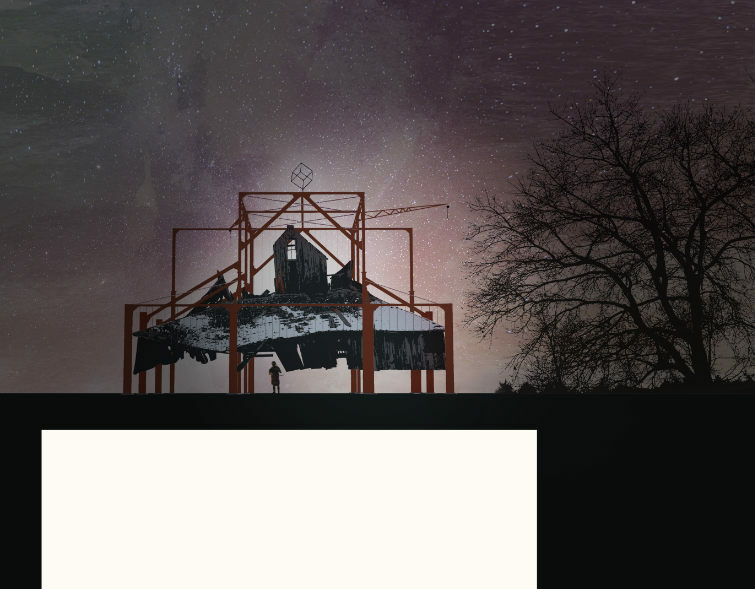 By picking up the pieces of a collapsed barn and suspending them with steel cables from a steel exoskeleton, the Marionette Project brings exposure to the plight of the vanishing late 19th-century farm buildings while proposing new perspectives on heritage based on their impermanence. Over the years, numerous artists, writers, musicians, and performers have used the 'Floating Barn' as their muse, installation site, or performance venue. We are in the process of compiling documentation of all projects and their corresponding artists in relation to the 'Floating Barn'. In the meantime, visit this page periodically as the featured work will change from time to time. This page is currently in progress. The forthcoming featured work will be excerpts from a&h, from resident musician Craig Schenker (AF '18) with footage from resident artist Xiaofu Wang (AF '18).